I love this artist! 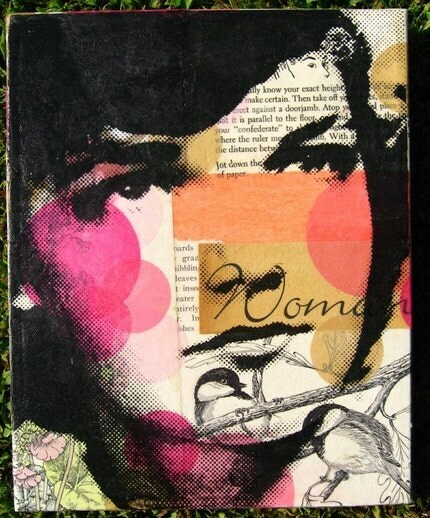 She has a great way to overlay images onto vintage papers, fabric, and other such media. She was featured in this month's Somerset Studios. I just have to do this with some of my old family photos... I LOVE IT!!! She takes commissions too. What a unique art piece. This collaged piece is amazing in color and pattern! I have a thing for trees anyways, but the whole piece is full of natural shapes and amazing detail. I'm so inspired to use my paper scraps this way! This is a great example of image transfer onto a painted background. I'm not sure that this is how this artist did this work, but that's what I immediately think of. It gives it such a moody and emotional feel to the piece. approx 40 x 40 cm. This artist has a whole series of "skin like" textural pieces. I love the colors and the subtle imagery of a nose and the distressed stripes. It's a feast of sensory overload! Hiya Jen!!! OMG OMG OMG - just making my way through the incredible new Willie-B DT list, and saw your name!! *waving madly* - since finding your work over at BadGirls you have been such an inspiration, so forward to working with ya!